Published by Joshua Clare-Flagg on 14 Apr, 2015. 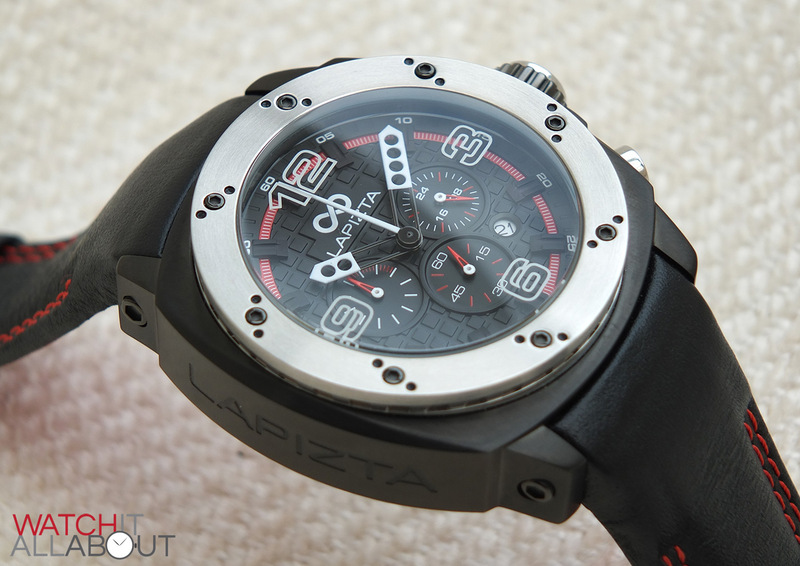 Lapizta are a brand I haven’t heard too much of before, and I’m always up for starting new relationships with watch brands. So when Mauricio, the CEO, offered to send a watch for review my inquisitive self just couldn’t refuse. 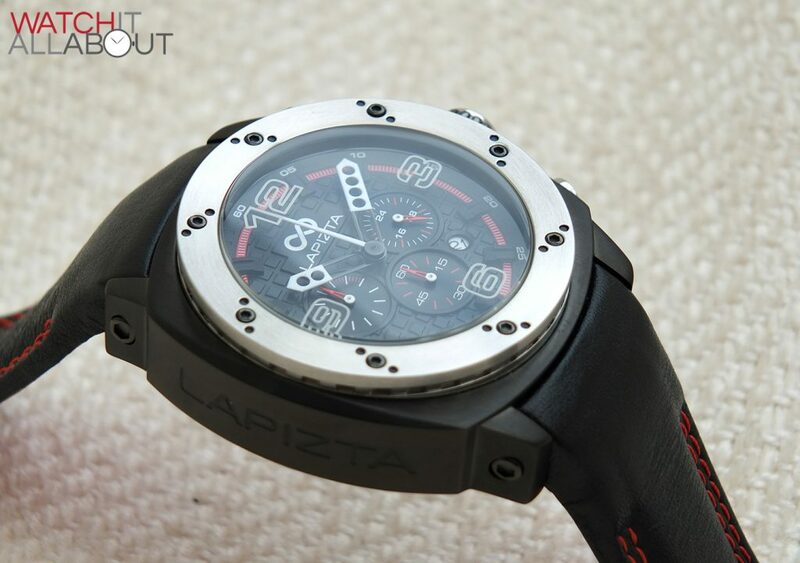 Based in Florida, Lapizta predominantly focus on sport enquired watches – whether it be racing, aviation, or boat. The watch that caught my eye was the Oryx. Looking at it, it’s quite the beast and has some interesting design cues. It also looks to be quite complex in construction which I really appreciate. 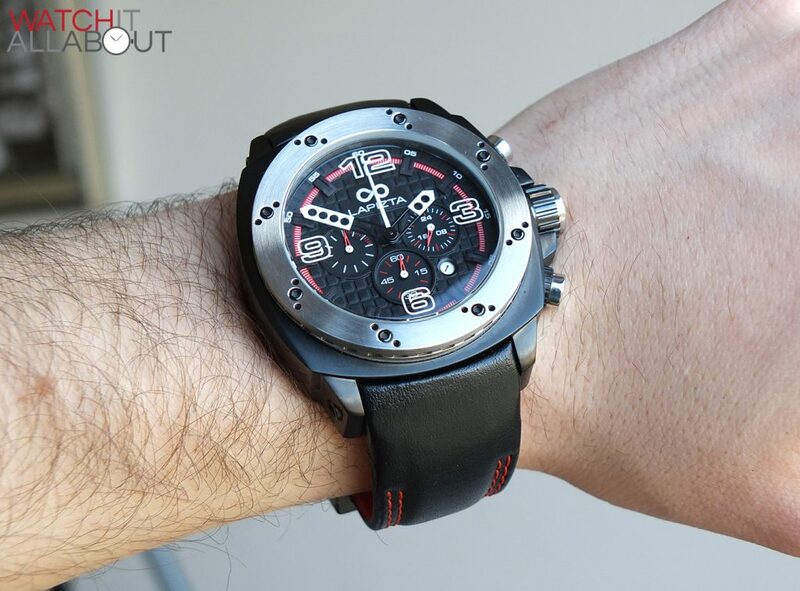 Although the design is not for everyone, it’s still an interesting watch. It’ll cost you $595 / £400 – so let’s see if this is a good price. There’s no doubt about it, you definitely get your money’s worth when it comes to the size of the Oryx. Measuring in at 48mm in diameter, with a lug to lug length of 54.5mm, and a height of 18mm, you’re getting a truly impressive timepiece. The size is pretty much the deciding factor for many. For those who like smaller watches, the Oryx isn’t for you. But, if you’re like me, and love a mighty and substantial timepiece strapped to your wrist, then it’ll suit you perfectly. 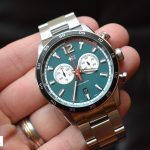 Whilst it’s got a large diameter at 48mm, thanks to the dumpy lugs it fits on medium wrist sizes (I’m 7.5″, but I don’t think you could get away with a smaller wrist). The height is also taller than one would be used to. 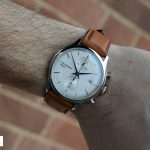 It’s definitely a watch that is designed to be worn with a tshirt or short sleeves – firstly so you can show off the watch, but secondly because it’s petty hard to fit it under a cuff. The weight of the Oryx is 180g, so it feels very considerable on the wrist, reassuring you of its quality. The crystal has a slight dome, offering a subtle distortion at right angles. It is a mineral crystal with sapphire coating; which I’ve seen used a number of times. This is because the manufacturers say that it offers the best of both worlds – the scratch resistance of sapphire, with the shatter resistance of mineral. I’m pretty happy with how it’s turned out – it’s very clear, and it’s thick too – providing a decent thud noise when you tap it. It has a layer of anti-reflective coating in the underside, but be wise of the domed top, it doesn’t seem to stop the reflections that well – the watch was a bit of a pain to photograph because of all the reflections. 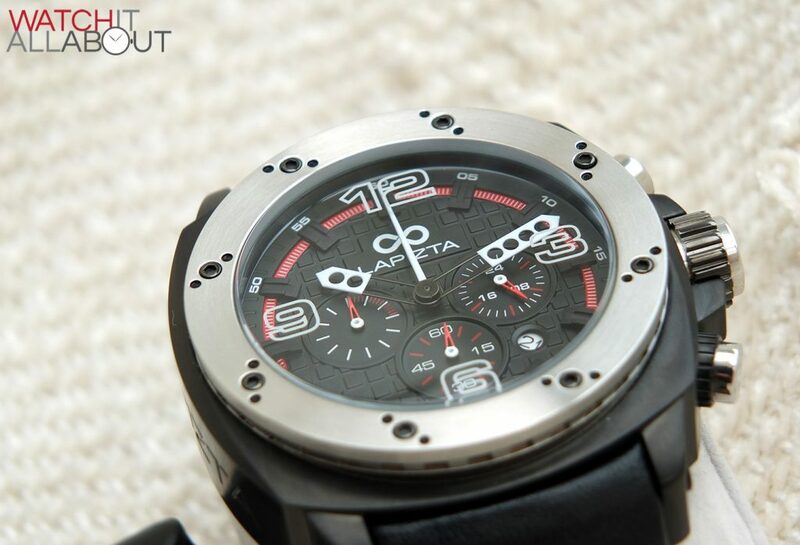 It has distinctive and strongly designed numbers printed in the on underside, which reminds me of Chopard. Not a bad thing. They almost float across the dial, which is a pleasant design feature of the watch. And not having the numbers on the dial itself allows it to dedicate that space for other things. The screw-in crown is a size that matches the watch, measuring in at 10mm on its own. It’s flanked by two stumpy but effective crown guards. The crown is an impressive element on its own, with a thick band of flat teeth applied to the centre of the polished steel cylinder. 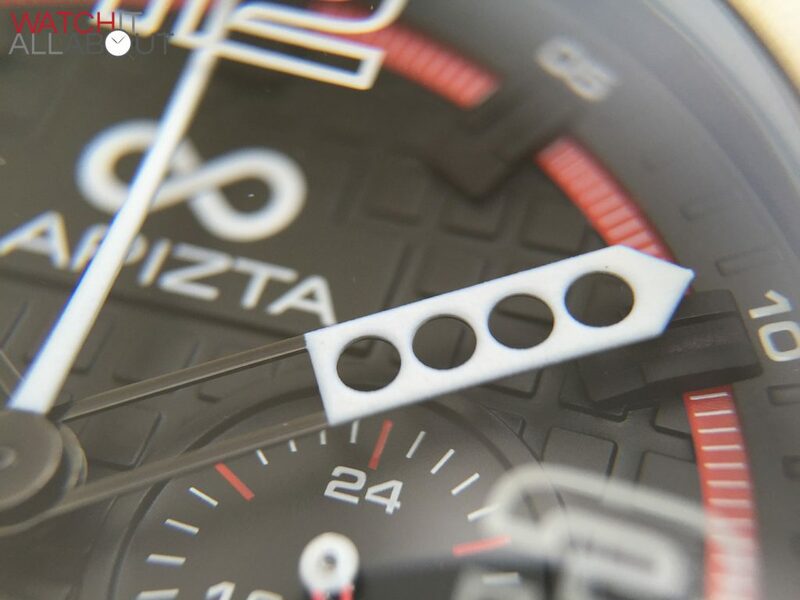 It has the Lapizta infinity symbol (or lemniscate) neatly etched in the end, which lines up perfectly flat to the case when you screw it in – which surprisingly doesn’t happen anywhere near as often as you’d hope with watches below £1000. I guess it’s an extra complication and cost getting it lined up they’d rather not have to worry about. The pushers are designed and made to give a similar feel and look as the crown, so the right side of the case is all unison in appearance. The pushers themselves are polished, with a slight curved end so they’re not sharp to the touch. The pushers are surrounded by what appears to be the grip of a screw-down pusher lock (like what’s found on the Alpha Radomir), which almost matches the grip on the crown, thus following the design through. 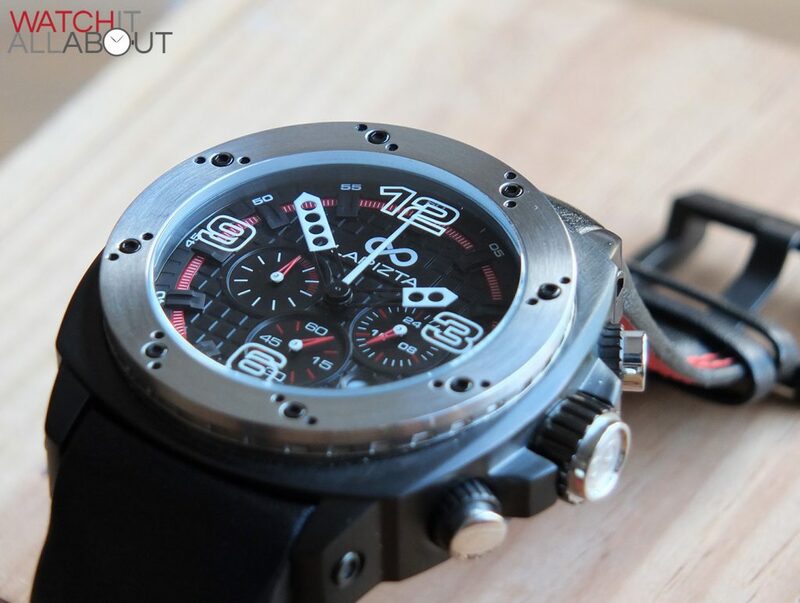 The pushers give positive feedback and are nice and large, perfect for using the chronograph. 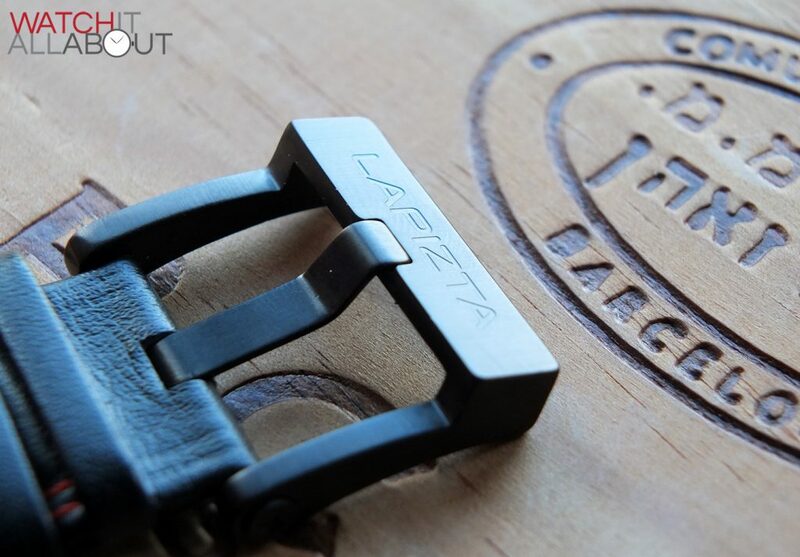 On the opposite side of the case, you’ll find the word Lapizta etched along the length of it. Don’t worry, it’s not like what you’d find on an Invicta. Because it’s PVD, it’s actually quite subtle to look at and isn’t an eye sore, even though the etching is pleasantly deep. 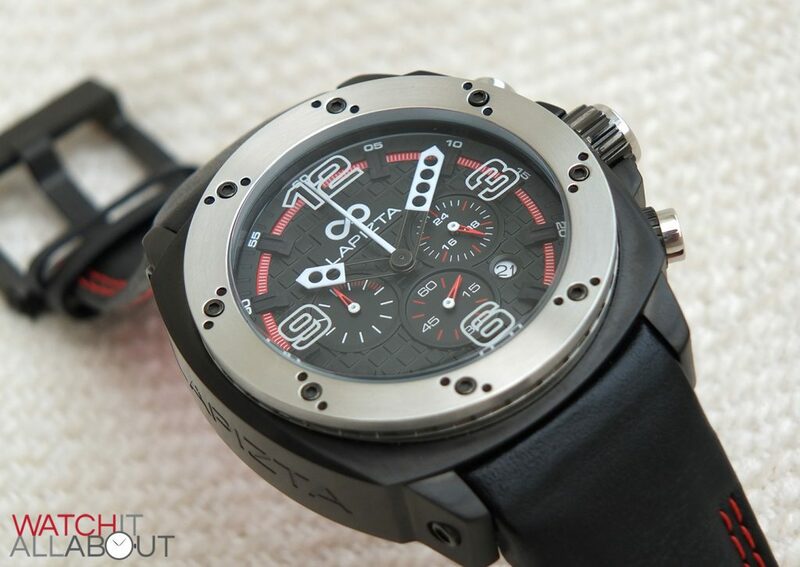 The bezel is inspired by a brake disc, and I think it looks and feels great. I like the trio of holes where the screws are located, mimicking a brake disc perfectly. 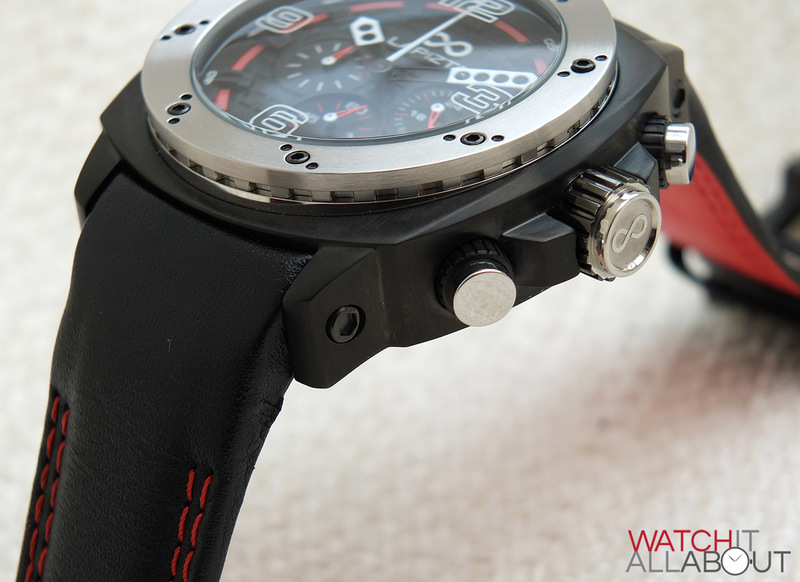 I also like the usage of hex screws, working towards the Motorsport feel of the watch well. It’s stainless steel, with a circular brushed finish, which offsets the black case. Looking at the bezel side-on presents an added level of complexity which is nice to see, it’s almost like a tooth sandwich, with two layers of steel above and below a grooved layer. A nice touch of extra attention to detail there, as the bezel could have been just one simple piece of steel with no special machining. 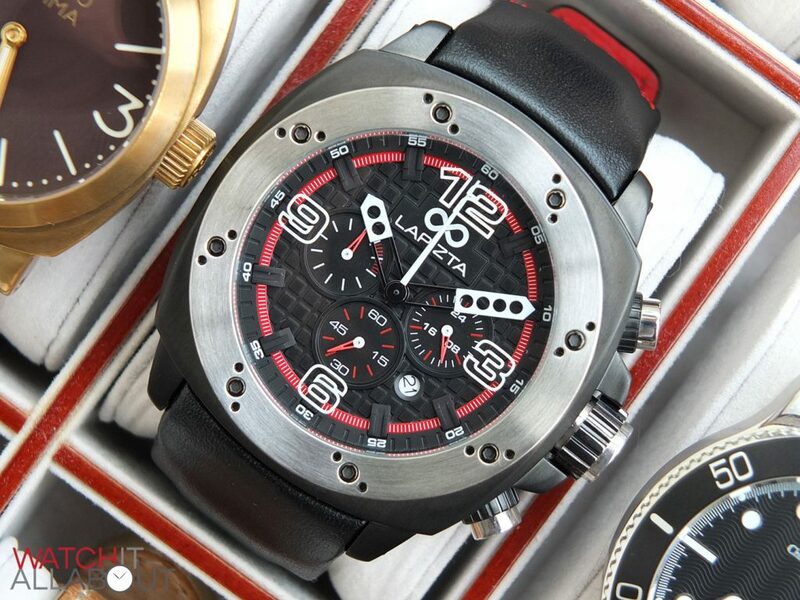 The case is PVD plated, which is inspired by a racing cars gear stick. The posting Serbs to be thick and uniform, and I’d say that it’s likely to last a while. The screw-in caseback is fairly simple, yet pleasant. It has a brushed outer ring, with a polished centre which houses the interesting stuff. 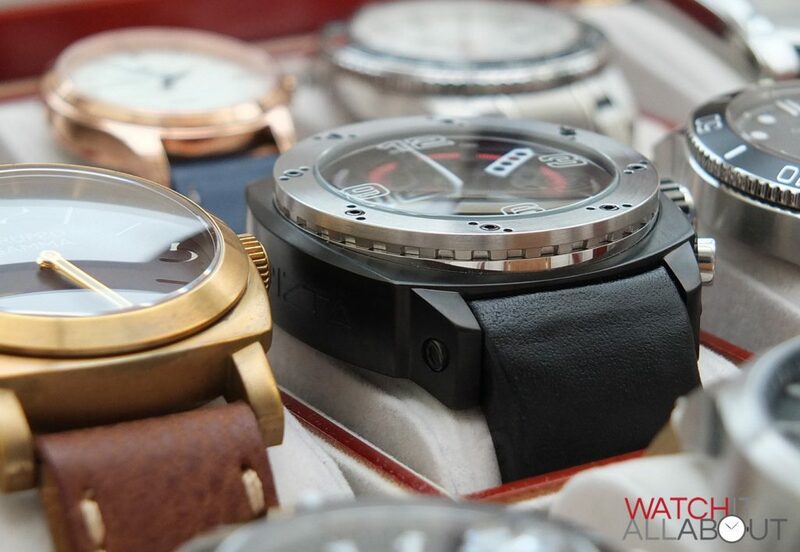 Around the outside is a variety of watch specifics, such as the name, model number, and what it’s made of. 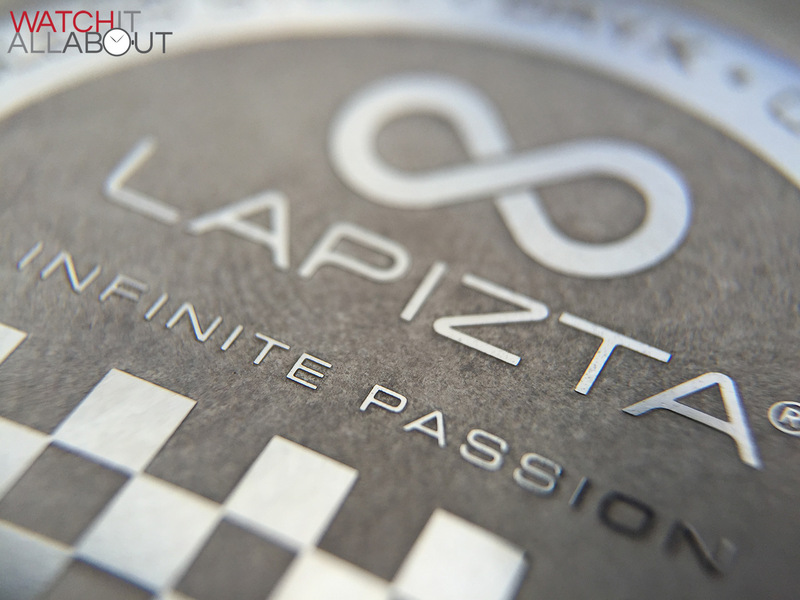 Within this ring is a checkered flag in the bottom half and the Lapizta logo in the top half, all offset on a blasted finish which is attractive to the eye when coupled with the variety of finishes on the rear of the watch. The Oryx has a water resistance rating of 100m, which is perfectly acceptable for a watch that’s not aimed towards water sports. With 100m, you can fully submerge it, and you can swim and go snorkelling in it. It’s just not suitable for deeper swimming, such as scuba diving. The case as a whole is impressive, with a variety of facets and elements to it. You definitely feel that you’re getting your money’s worth which is good. 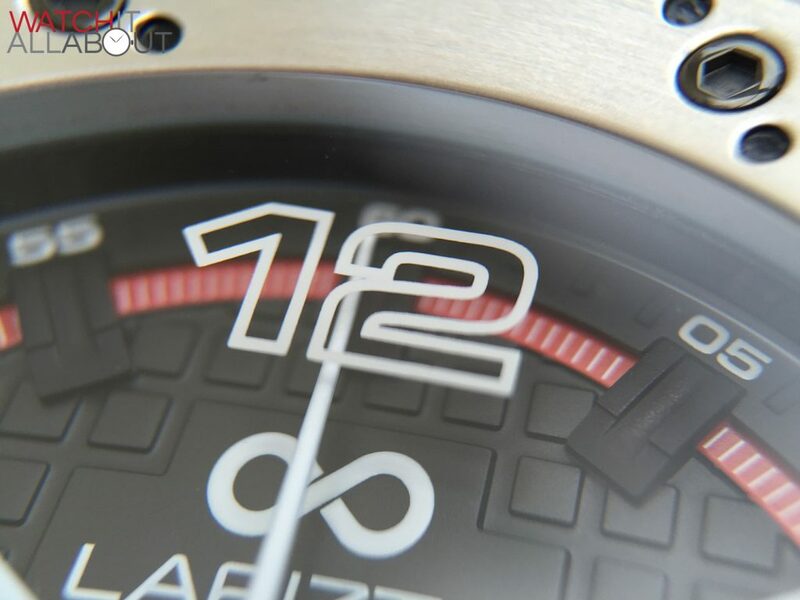 The dial is mainly characterised by its checkered pattern, to mimic the checkered flag you’d see on a race track. The checkering is very precise indeed. The dial in its entirety is three layered, and provides lovely depth and texture that I really like. 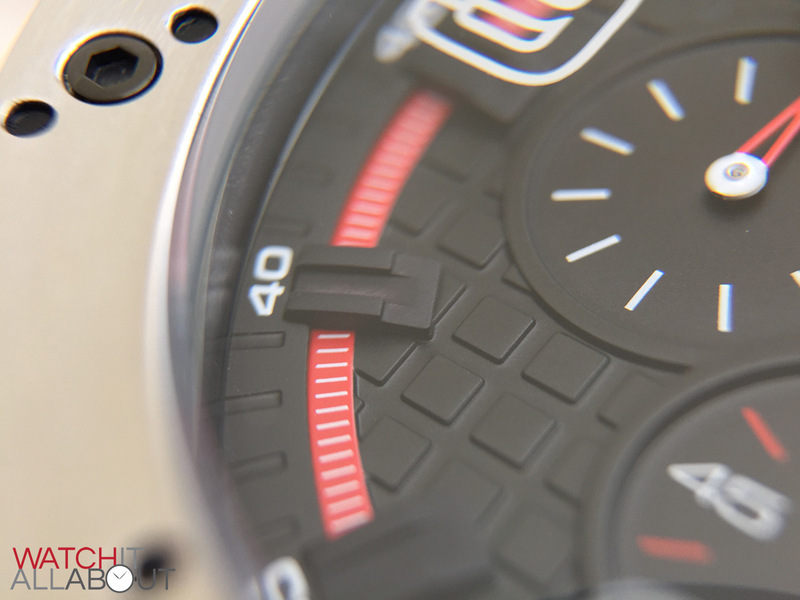 The subdials are designed to mimic the dials you’d find on the dashboard of a sportscar. This is evident from the flashes of red throughout the markings, and also the raised borders they have that allow them to stand out against the complicated checkered pattern of the dial. The hands of the subdials are all neat skeletonised white arrows with a red base. 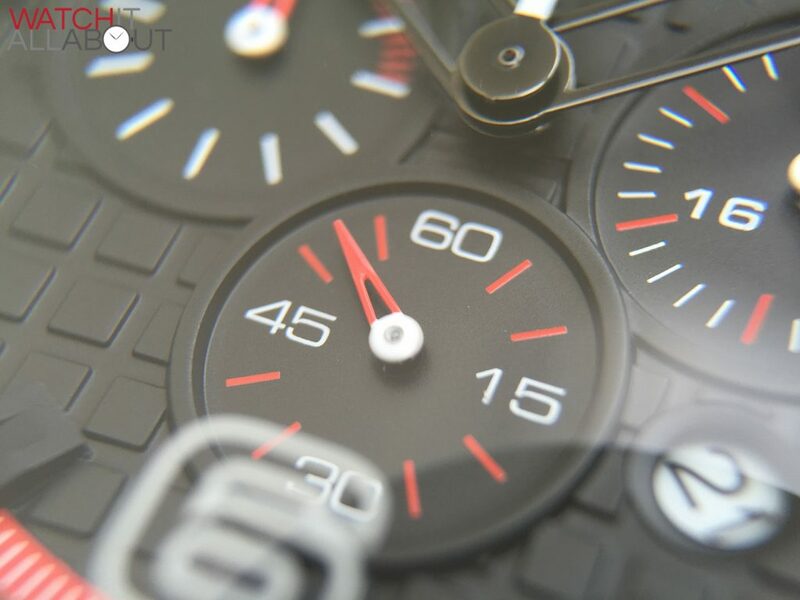 The left subdial is chronograph minutes, the bottom is the running seconds, and the right is a 24hr indicator. 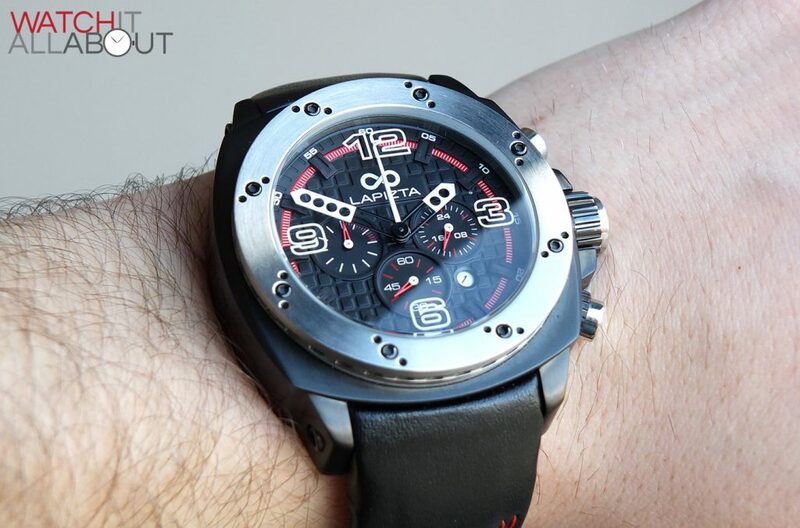 Another nod to racing is the minute and hour hands, designed in a way to mimic the starting lights on a race track. The white lumed tips have a row of holes drilled into them; two on the hour hand and 4 on the minute hand. The second hand is a simple long white point. 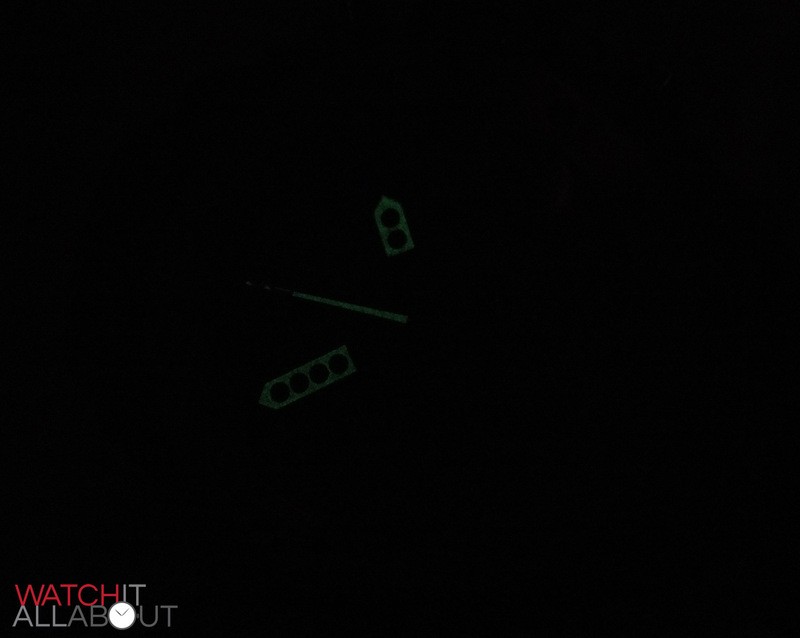 The lume is average at best, in fact I haven’t been able to really see it much in day to day usage. The base of the minute and hour hands are actually skeletonised also. I was worried that it would make them hard to read but surprisingly they stand out perfectly well against the dial and provide good legibility. 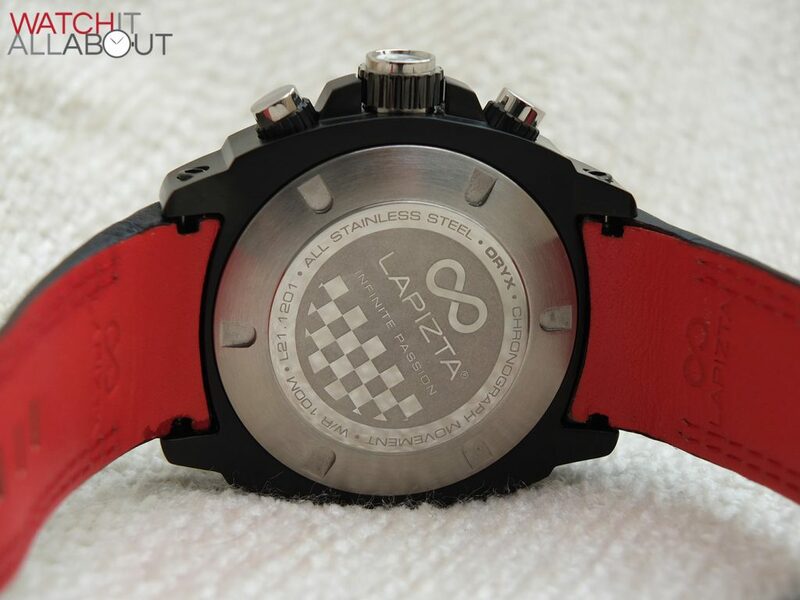 The Lapizta logo is located at the top half of the dial, on its own platform that’s the same raised height as the checkered pattern. The printing is smooth and bold, yet precise. The round date window is located between 4 and 5, and is quite small and subtle. 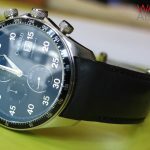 It has a straightforward rounded border to it, creating a smooth transition from the complex dial texture to the wheel itself. The wheel is white with black text. Some may complain that it’s not the same colour as the dial, but I think that there’s enough white elements on the dial that it appears to match well. 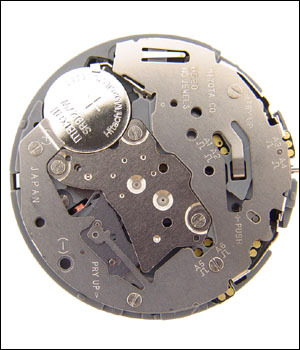 Around the outer edge of the dial is a detailed minute track, incorporating the hour markers. 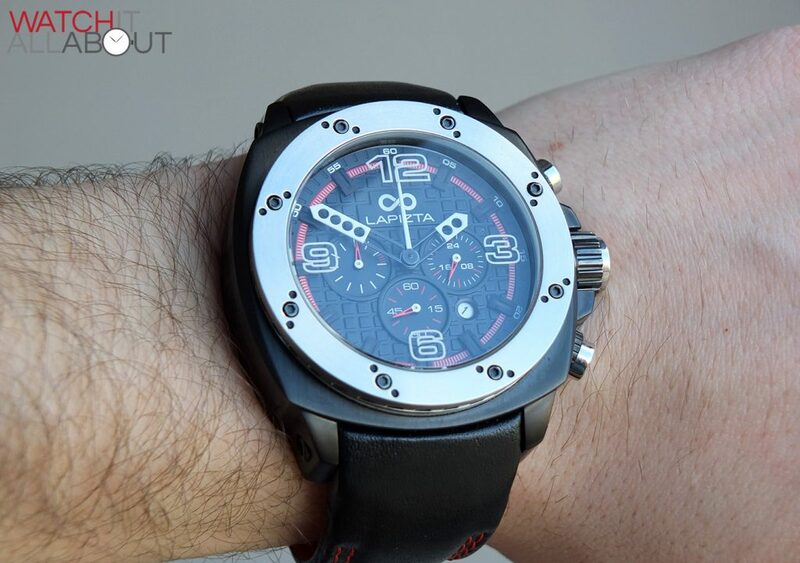 The hour markers seem to be inspired by Hublot, as they are exactly the same in design as those you’d find on a Big Bang – wide, with two raised edges, and a pitch on the inside bottom edge. They’re all the same length and align up nicely over the outer chapter ring and the inner dial. 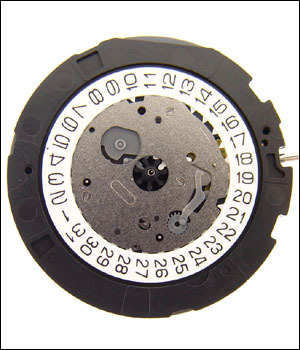 The minute track is split into two rings, one inner ring, which is red with white lines at every 5th of a second, and an outer black ring with well formed indents at every minute, and the number printed at every 5 minutes. This outer chapter ring edges the main section of the dial well, not only offering a bit of colour but also keeps things interesting. I’m pretty impressed by the overall detailing of the dial. Although it’s all very complex, it’s made without fault and is obviously high quality, that took some serious skill to manufacture. The leather strap is a suitable heart width to counteract the size of the case. It actually does a very good job at keeping the balance equal whist on the wrist, the case doesn’t misbehave and roll off, which can be frustrating. There’s no wonder when you realise that the strap measures a whipping 26mm wide at the lugs, reducing to 24mm at the buckle. 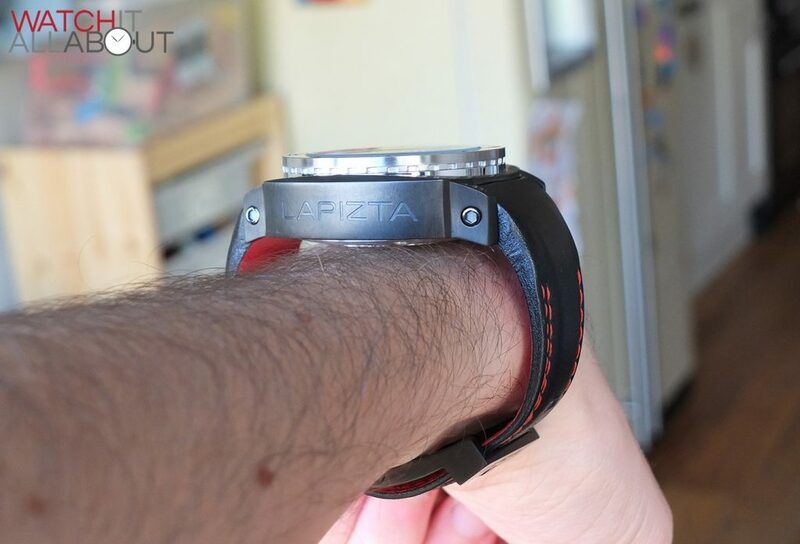 I think this is the widest strap I’ve reviewed on a watch. But the Oryx hides the epic width well, and it doesn’t look preposterous. In fact, it looks right. Any thinner and it would look completely out of proportion. 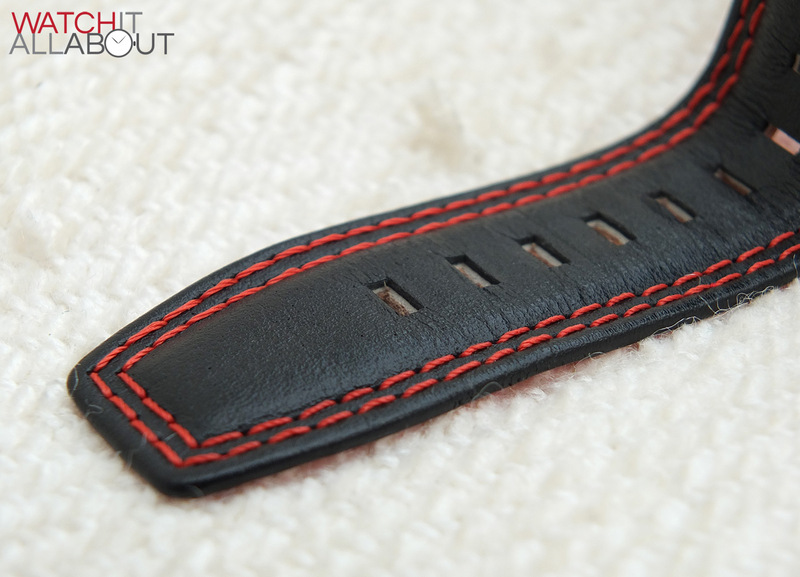 The strap is black leather with red stitching, and a red underside too. This is reminiscent of and designed to mimic racing car seats, which I feel it does well. The double red stitching is particularly racing-esque and also looks pretty cool. The sticking is all very neatly and accurately stitched, and the stitches are clearly high quality, giving you a sense of quality and the feeling that this strap won’t fall apart easily. The red of the underside is a colour synonymous with racing thanks to Ferrari, again providing an interesting and unexpected splash of colour that works well with the watch. 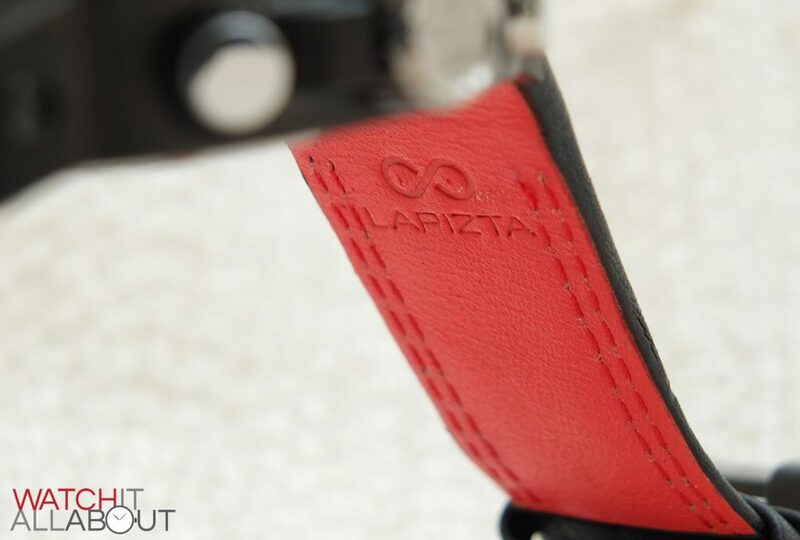 The Lapizta logo is also precisely punched into the underside of the strap, at the lug end of both parts. Cool. The tang buckle is IP coated to match the case, and is also quite angular in construction to carry the design through. It has the Lapizta logo etched on the top bar, which in my eyes would have been better ever so slightly deeper as you can’t see it quite as much as I’d like. The engraving is still pretty exact though. 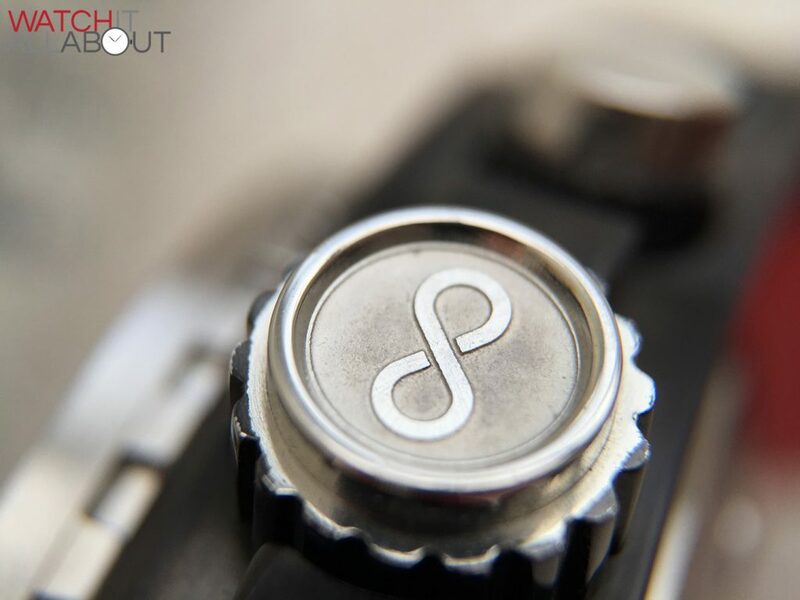 The pin is reminiscent of a curved pre-v buckle, which bends and is shaped to fit the holes in the strap better, thus reducing wear and allowing the strap to last longer. 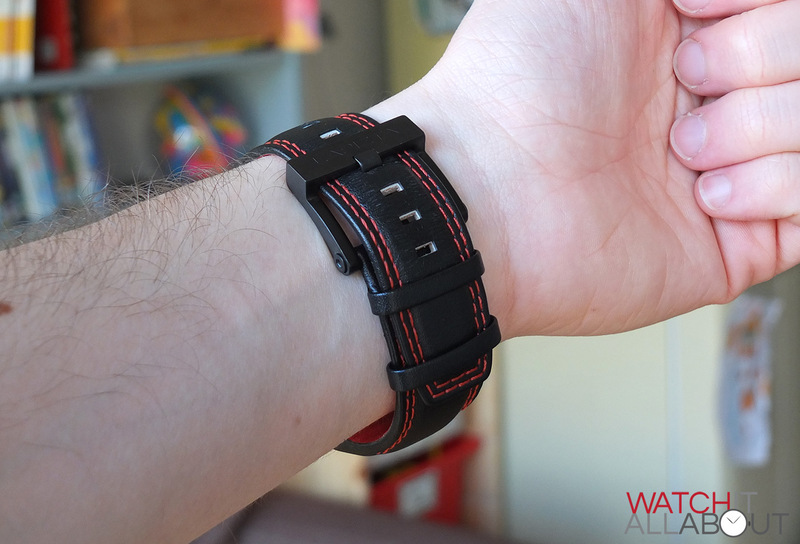 As I mentioned before, I do like the usage of hex screws around the watch – which continues through into the strap. They are used on the buckle and lug pins. 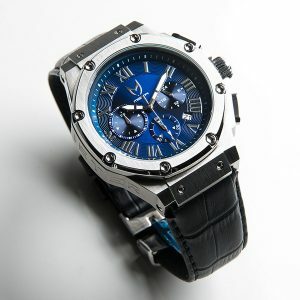 The leather is soft, and it works well towards keeping this large and heavy watch comfortable. It’s good quality, supple, and feels class on the wrist. 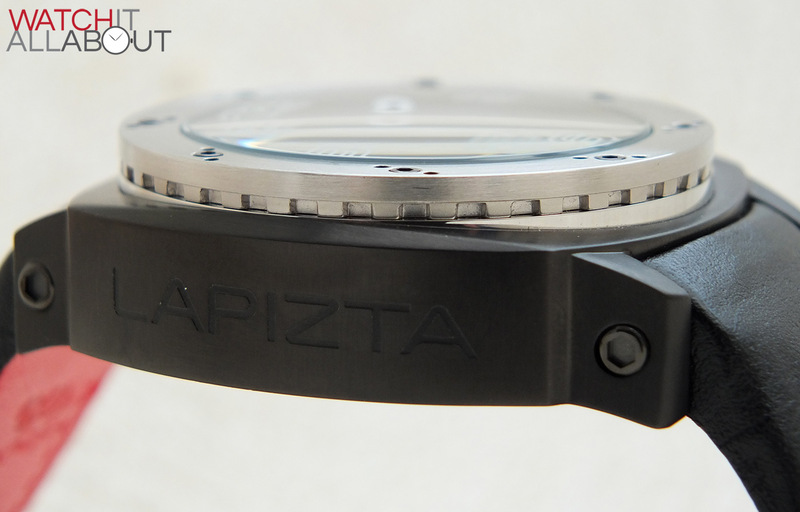 The movement powering the Lapizta Oryx is a Miyota OS20 Quartz chronograph. 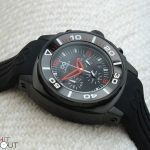 It’s solid, dependable, and used a huge amount in a wide range of watches. There’s really not a great deal to say about it, apart from if offers a 5 year battery life, and has an accuracy of +/-20 seconds a month. It’s pretty useful having a solid chronograph in the collection. I use one every day to time my dog walks and I’ve been pretty happy with how the Lapizta Oryx has performed. 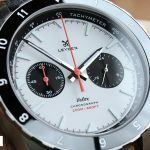 The movement feels good in the hand when you’re altering the time or date, and proceed good feedback through the chronograph buttons. I’m pretty confident that the movement in the Oryx will last for a very long time. There’s not a great deal out there offering such an impressively sized watch for the same price which is designed in a similar way. 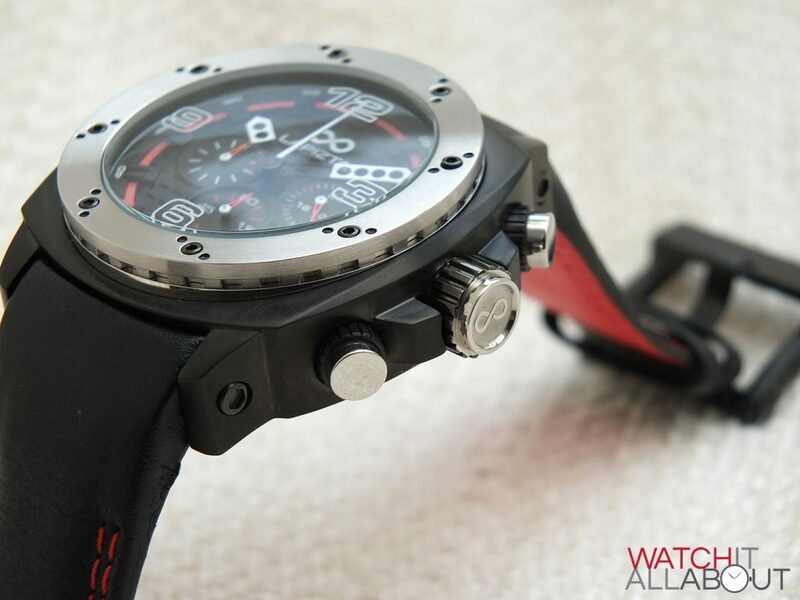 The watch that is most like the Oryx that springs to my mind is the Meister Ambassador. I haven’t reviewed or seen one in the flesh, but it looks pretty good for the price ($300-$400) and is styled in a similar vein to the Oryx. 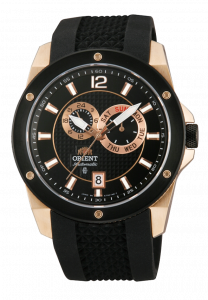 Another watch is the Orient Elite, which is an automatic and will cost $395. Again, its styled similarly and would be impressive build quality as all Orients are. 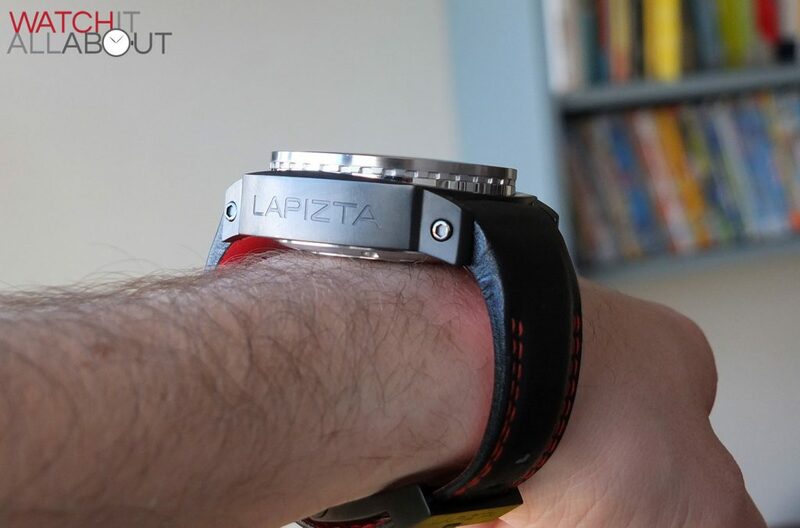 Obviously the Lapizta Oryx is a watch that won’t be for everyone. 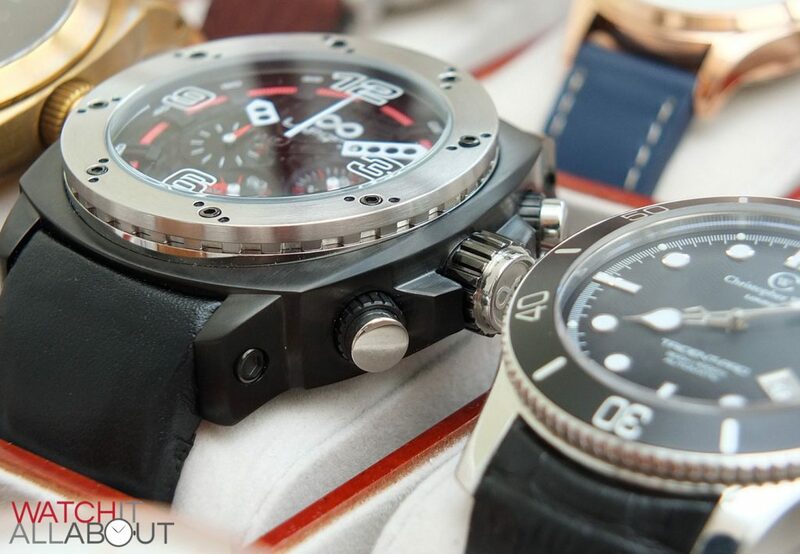 You need to be able to carry off a large watch on the wrist, and like larger sized timepieces too. But, if it does call out to you then I would highly recommend it. I’ve really enjoyed my time wearing it, and there’s not a lot else out there that offers quite this much watch for the money. The packaging is impressive too, which provides an enjoyable opening experience and is always a pleasant surprise. 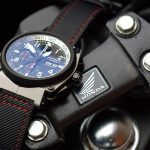 There’s obviously been a lot of thought into the design, and the fit and finish, and also the level of complexity to the watch makes it a timepiece that really stands out. Bought one, right from the start it had issues. After a while took it to jeweler who said it had a defect, return it under warranty. Lapizta said nope. On my own. Never offer to fix it, sell me a new one, nothing. To me, over priced crap with worse service.